This sweet water lake is located in the west side of the Galilee, a major source of water supply, center of tourism, and rich with history. 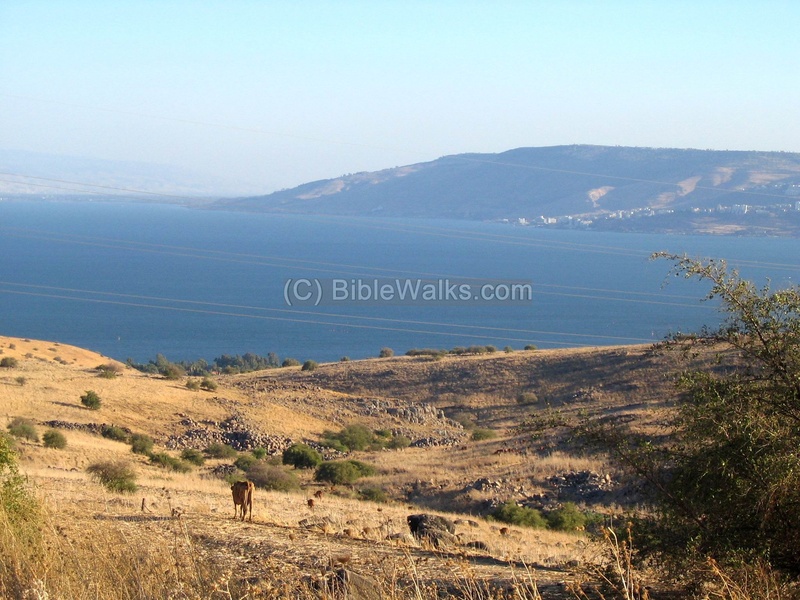 This is an overview page of the area of the Sea of Galilee. 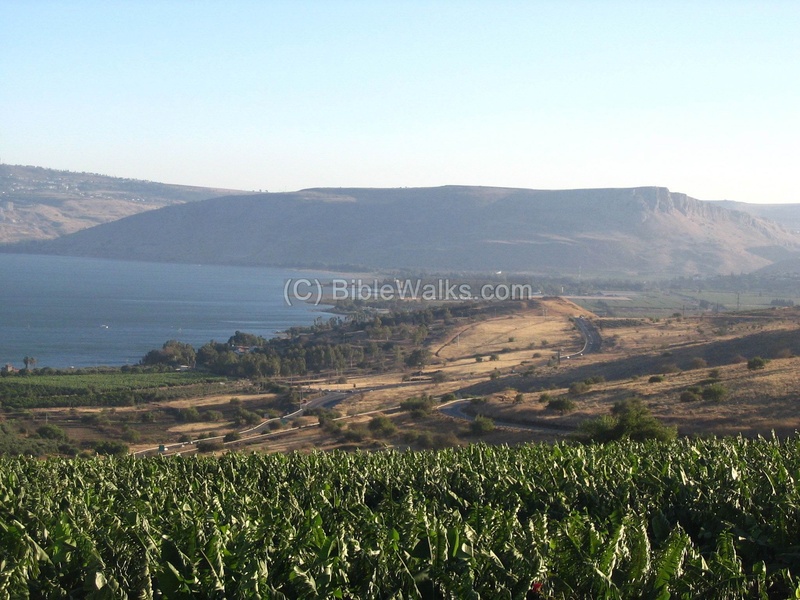 The Sea of Galilee is located in the east side of the Galilee, in the north of Israel. It is a large sweet water lake (168 square KM), has 55KM of shore line, 21KM long X 12KM wide (at its widest section at the Arbel cliffs), and has a kind of the shape of a pear or a violin. The lake is shallow - the maximum depth is 44M. The entire lake is located within a great depression, about 210M below the (Mediterranean) sea level. It is the lowest sweet water lake in the world. The hills around the lake are even higher: 400-500M above the lake's level. This depression is part of the Syrian-African fault line, which includes the Dead Sea. Most of its water comes from the northern Jordan river. It also comes from springs and flow of water from the surrounding hills in the winter time. The water comes out through the southern Jordan river that flows to the Dead sea. The water is regulated, so the southern dam is rarely open, mostly in wet winters. The water is also pumped out and supplied to the south of Israel by the the ambitious project called "Movil Haartsi", or the national water canal. 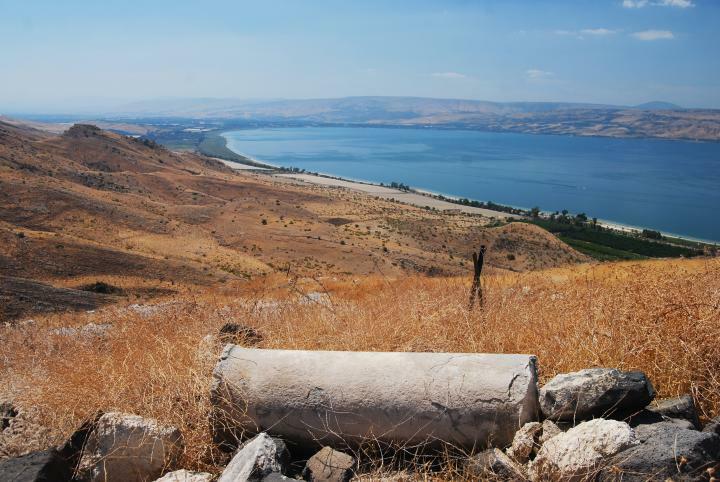 This project has a number of facilities in the Sea of Galilee - a huge water pump in the north-west side of the lake near Tabcha, and bypass canals that divert the "salty" water (hot springs) around the lake, in order to keep the lake clean. Some of the water is also supplied to the Kingdom of Jordan, as part of the peace treaty with this neighboring Country. 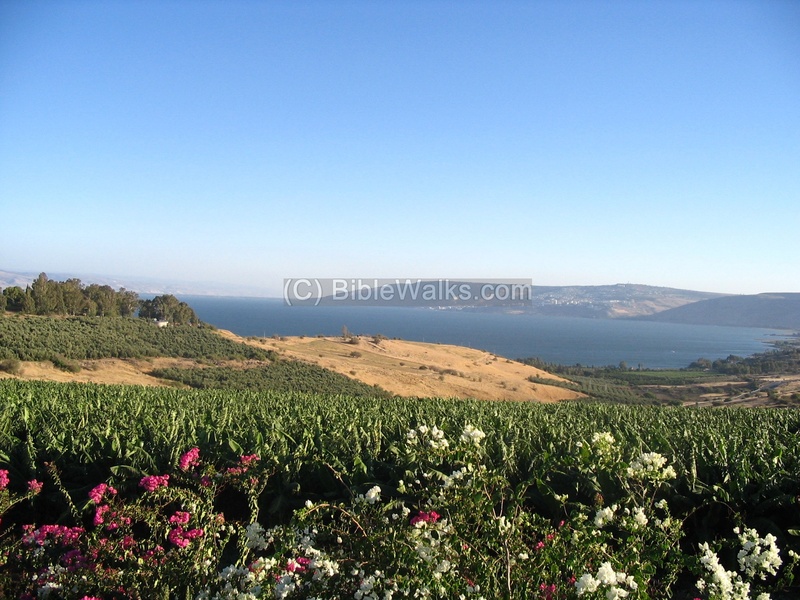 We start with Tiberias, the big city on the west shore of the Sea of Galilee. The following photo shows the new city, the Sea of Galilee behind it, and the Golan heights in the background. 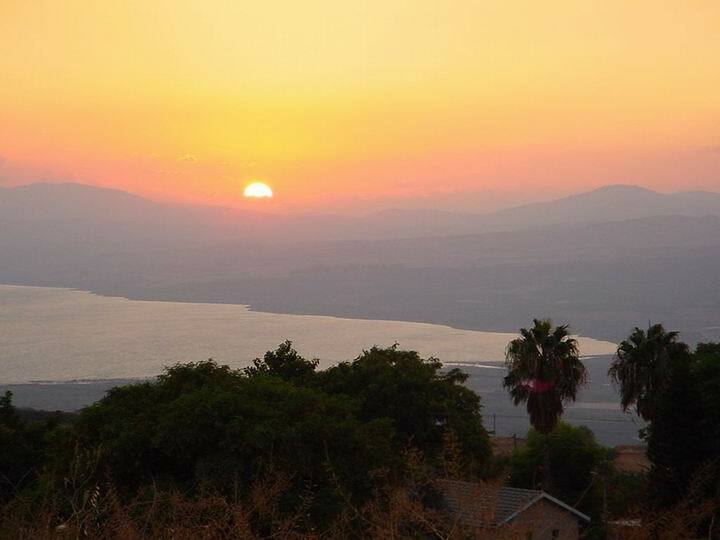 The sea of Galilee has a hot and dry weather, sweet water, and calming atmosphere. This makes it a favorite vacationland. During almost year round the lake is full of tourists, and especially local tourism on the weekends. 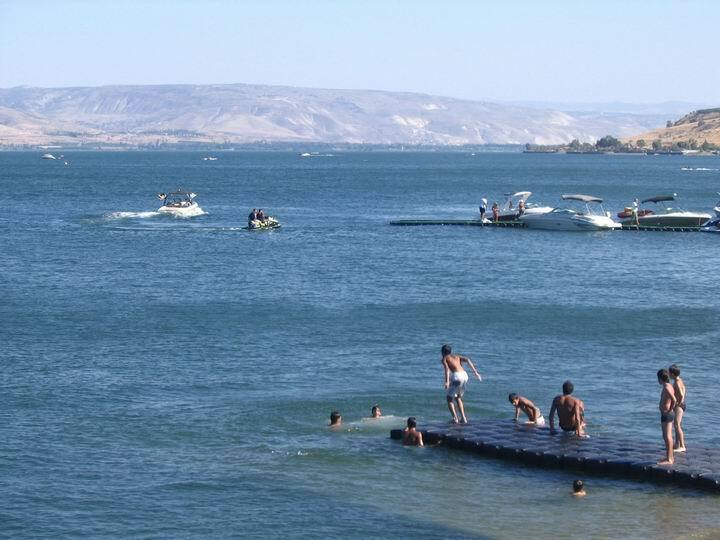 The entire lake is surrounded by public and private beaches, and high-rising hotels in Tiberias. This photo is looking in the south of the lake, towards east. In the foreground are Kibbutz Kinnereth and Kibbutz Degania. On the shore (at the left side) lay the ancient ruins of Beit-Yerach. On the right side of the shore line - the Yardenit baptismal, where the Jordan river starts its long and slow flow to the south. In the remote background are the hills of the Golan heights, with Syria hidden way behind the leftmost hills. The Kingdom of Jordan is located on the right darker hills. 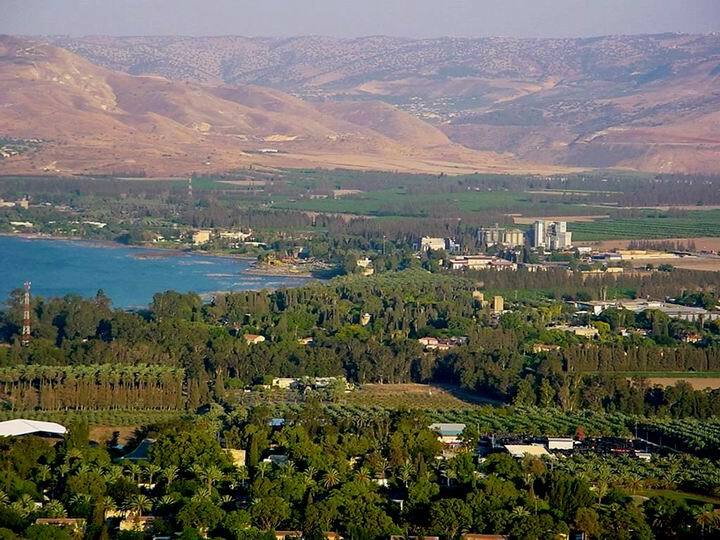 Between the hills is the Yarmuch valley, which its river flows into the Jordan river 10 Km to the south. This is the view from the north side. In the background hills - the city of Tiberias. Driving along the road that descends from the hills around, you pass signs of "Sea level", since the lake is about -210M (below sea level). In the photo below you can see the Arbel cliffs in the west side of the lake. Under the cliffs , on the shore, is the ruins of Magdala. On the right side - the valley of Ginnosereth (Ginnosar). In the left side of the shore is Tabcha (seven springs). A sunset picture is seen in the following photo, taken from Maale-Gamla on the north-east side of the lake. 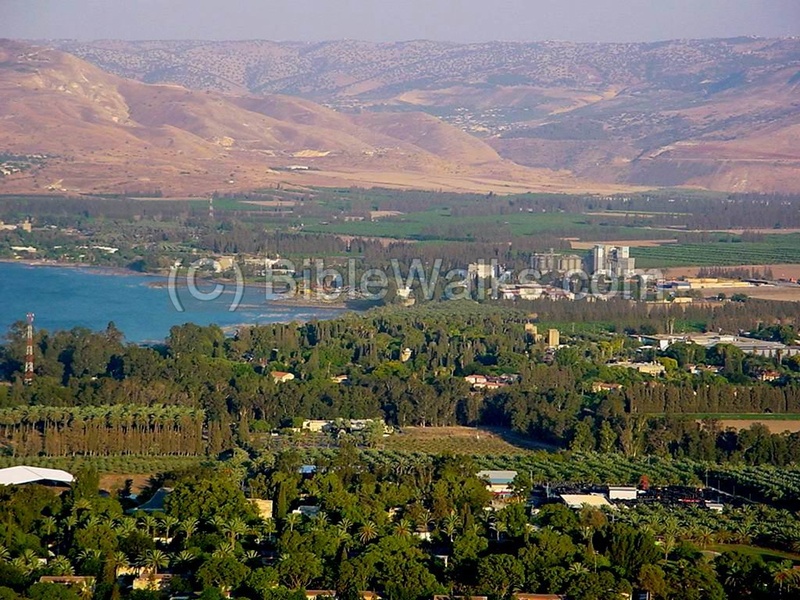 On the right side is the valley of BethSaida, where the northern Jordan river flows into the lake. A view of the southeast side of the sea of Galilee is seen from the mountain of Hippos/Sussita, a Graeco-Roman and Byzantine site - one of the most remarkable archaeological sites in the Galilee. 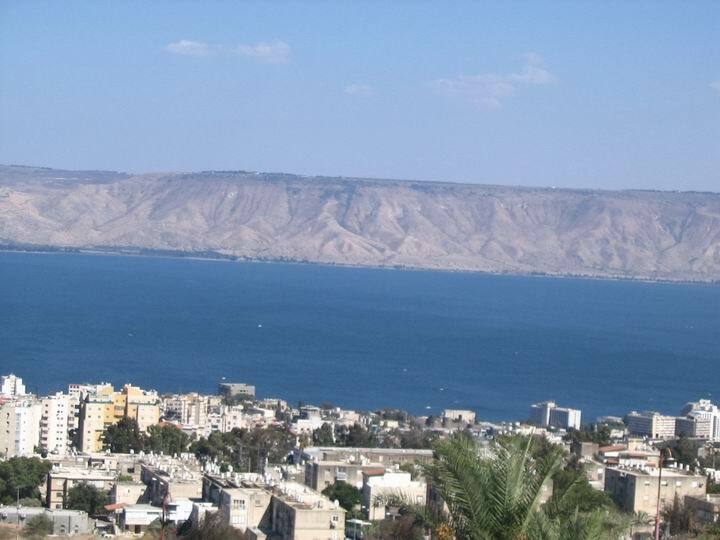 1: After these things Jesus went over the sea of Galilee, which is the sea of Tiberias. Many more references are in the four Gospels - see a complete list in "Jesus footsteps". (a) Kinor is in hebrew: violin. Since the shape of the lake resembles a violin, it may be the source of the name. (b) Kinar is a name of a old god, and is mentioned in the ancient Ugarit scribes (as well as Kinnereth). Hence the lake was named after this god. 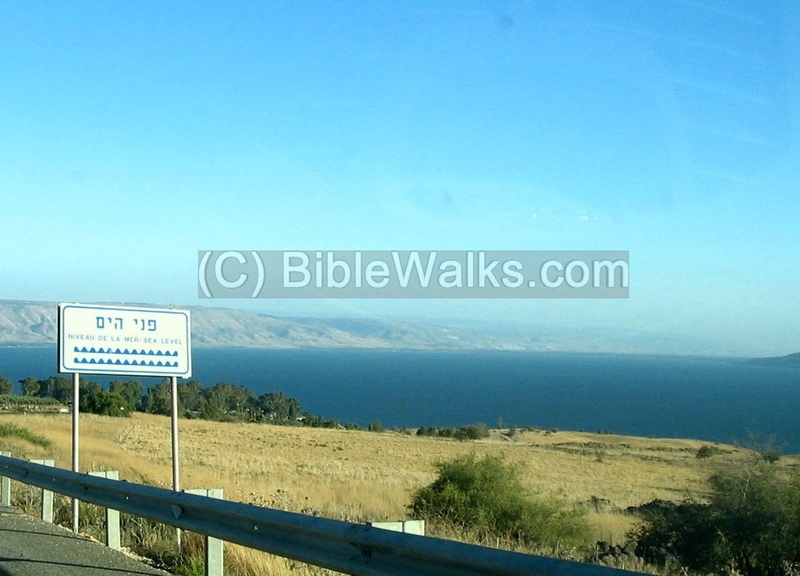 Sea of Tiberias - another name of the sea of Galilee. Tiberias is the major city in the area, and therefore the lake is called after it. Sea of Ginosar (Ginnosereth)- yet another name of the lake; called after the valley on the north-west side. For a detailed sites map and aerial view - see map of the Sea of Galilee. See also news from the Galilee.